This year’s edition of the Paris Motor Show opens its doors to the press in exactly a month. We’ll publish live pics of any vintage cars we come across while covering the show for work, and we’re building up to it by looking at interesting and/or innovative concepts that have been presented at previous editions of the event. Volvo traveled to the 1992 edition of the Paris show to introduce a new concept dubbed simply Environmental Concept Car (ECC). The ECC was billed as a preview of what form a family sedan might take in the year 2000. Designed in California, the ECC eschewed Volvo’s traditional boxy design language in favor of a brand new look that was both aerodynamic and futuristic. The ECC’s front end stood out from the 850 on which it was based thanks to slim headlights, a V-shaped hood and a downsized rendition of Volvo’s traditional rectangular radiator grille. The ECC tipped the scale at 3,483 pounds (1,580 kilos) thanks in part to the use of lightweight materials like aluminum in its construction. Inside, the ECC was fitted with side airbags, a child seat integrated into the rear bench and a primitive-yet-innovative navigation software called Dynaguide that provided real-time traffic information via a display screen located on top of the dashboard. The cockpit was fitted with a wide, slanted center console and a four-spoke multi-function steering wheel. Power for the ECC came from a hybrid drivetrain consisting of a gas turbine and small electric motor linked to a nickel-cadmium battery pack. Both the motor and the turbine were compact enough to fit in the engine bay, while the battery pack was mounted in the transmission tunnel and under the trunk floor. Fully functional, the ECC’s hybrid drivetrain maxed out at 95 horsepower but period reports indicate it generally made about 76 ponies in everyday driving conditions. The sedan could reach 62 mph (100 km/h) from a stop in about 13 seconds and go on to a top speed of over 100 mph with both power sources running. Alternatively, the sprint to 62 mph could be completed in approximately 22 seconds when running on electricity alone. The turbine never spun the front wheels directly. Instead, it either charged the batteries or powered the electric motor depending on which driving mode was selected. Switches on the center console allowed the driver to alternate between electric power, turbine power or hybrid. The ECC had a total driving range of about 415 miles (667 kilometers) with a full tank of diesel to power the turbine or up to 90 miles (144 kilometers) on electricity alone in ideal driving conditions. In some aspects, Volvo’s vision of what a family car would look like in the year 2000 wasn’t too far off. 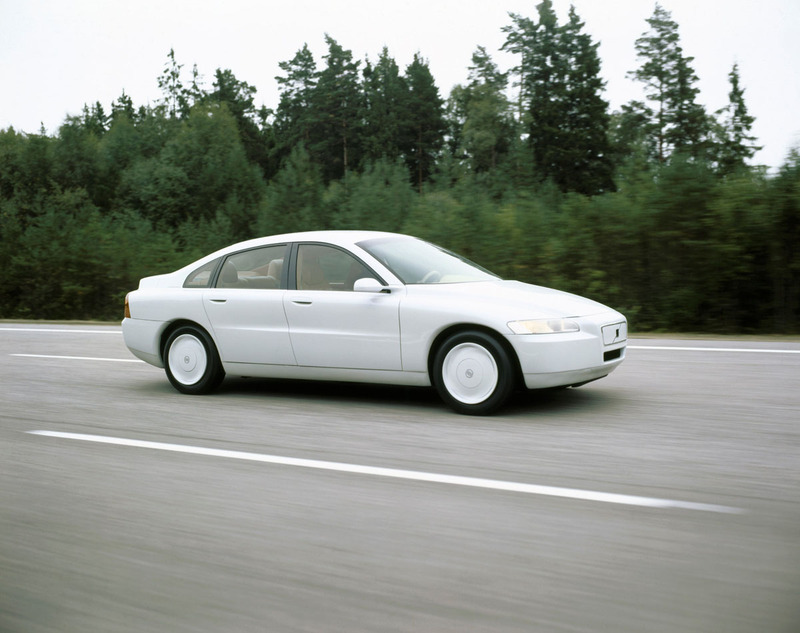 The ECC’s hybrid drivetrain obviously remained at the prototype stage, but in 2000 buyers could walk down to their local Volvo dealer and drive home in a sedan that looked a whole lot like the ECC. Additionally, The ECC’s 90-mile range is still respectable today: According to Nissan, the Leaf returns an average of 84 miles. Tags: Volvo. Bookmark the permalink.